Indian earrings and tikka set in gold and rhodium (silver colour) plated and sea green. Set with Fine American Diamonds stones. Set includes: Earrings and tikka. Set with semi-precious stones. Other colours available - enter the design NAME only (eg Jaina) in the Search box, to see all colours. 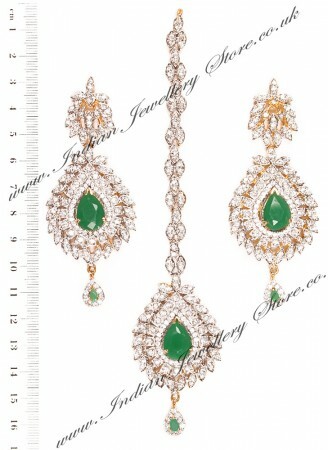 Indian Jewellery Store LOVES this product because is makes a statement but still oozes class and sophistication. Scale shown in image is in cm.